Rainbow City, AL, 8/3/11 – Rusty’s race-inspired stabilizer is a must for larger tires. It greatly improves steering response and handling, reduces wheel shimmy and vehicle wandering. Designed with heims for a more solid feeling and less flex out of the bushings, a must at pounding the rocks at high speed. Large chrome shaft and 10 stage valving will give you the performance and durability for both on and off road. 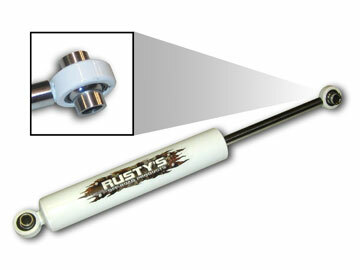 Price is $45 and can be purchased online at www.RustysOffroad.com or over the phone at 256-442-0607.